Windows 8 Metro browser wars started with both Mozilla and Chrome developing browsers compatible with the Metro interface. Just three days back we got the news that Mozilla is developing Firefox version for Metro interface and today Mashable is reporting that Google is also developing a version of its Chrome browser for Metro Interface. A Google spokesperson told Mashable that the new version of Chrome will be based on desktop version of the Chrome and not Android version. Google already has a Chrome for Android phones and tablets. Our goal is to be able to offer our users a speedy, simple, secure Chrome experience across all platforms, which includes both the desktop and Metro versions of Windows 8,â€ the rep said. â€œTo that end weâ€™re in the process of building a Metro version of Chrome along with improving desktop Chrome in Windows 8 such as adding enhanced touch support. That means we will have a choice to use the browser we like instead of the one that is tied to the Metro interface currently, that is IE10. But the downside is that Metro will support only one browser that is default to the system. We canâ€™t use Firefox and Chrome at a time in Metro. But on the Windows 8 desktop users can use any browser. This development makes sense as the default browser in Windows 8 Metro is IE10 with Bing search. 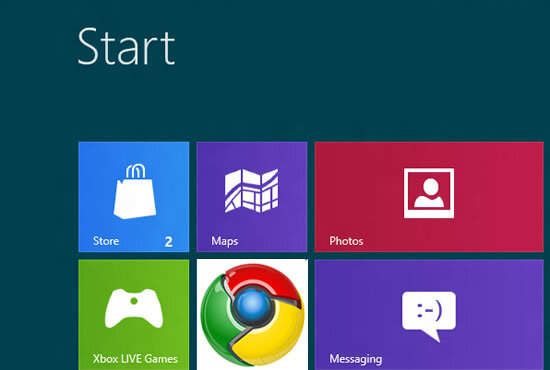 If Google doesnâ€™t develop Chrome for Metro interface in Windows 8 it is going to loose the search share and revenue. I was glad that there are more choices in win8 Metro, but the fact is that Metro will support only one browser ? What’s the purpose of this design? I like using chrome firefox and Avant browsers at the same time, and I think a lot of users have more than one browsers installed in their computer, but in win8, this way of life will be end.